This article will help you to understand how we can drop existing SQL Server Database with the help of SMO and PowerShell V3.0. If you do not have you sample data base created then follow the steps to create your database with PowerShell V3.0. To drop an SMO server or database object, we can simply invoke the Drop method. But, if you have ever tried dropping a database before, you might have already experienced being blocked by active connections to that database. 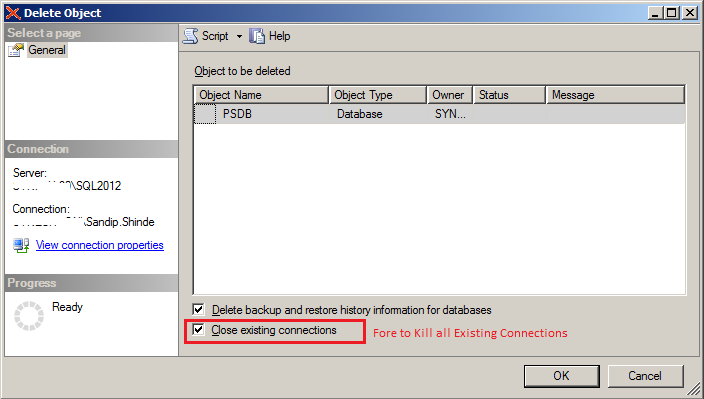 For this reason, we chose the KillDatabase method, which will kill active connections before dropping the database. This option is also available in SSMS when you tried to drop a database from Object Explorer. Right-click on a database, the Delete Object window will appear. At the bottom of the window you will find a checkbox called Close existing connections, selection of this check box will fore to kill all active connections before dropping the database. You are so interesting! I don’t suppose I have read through anything like this before. So good to find somebody with unique thoughts on this issue. Seriously.. thanks for starting this up. This web site is one thing that is needed on the web, someone with a little originality! I used the script first time successfully but after that it just gives me error whilst creating $DBObject. Sorry ignore above cause I have inserted another $server as string and that’s why it was returning null…cheers for the scripts.